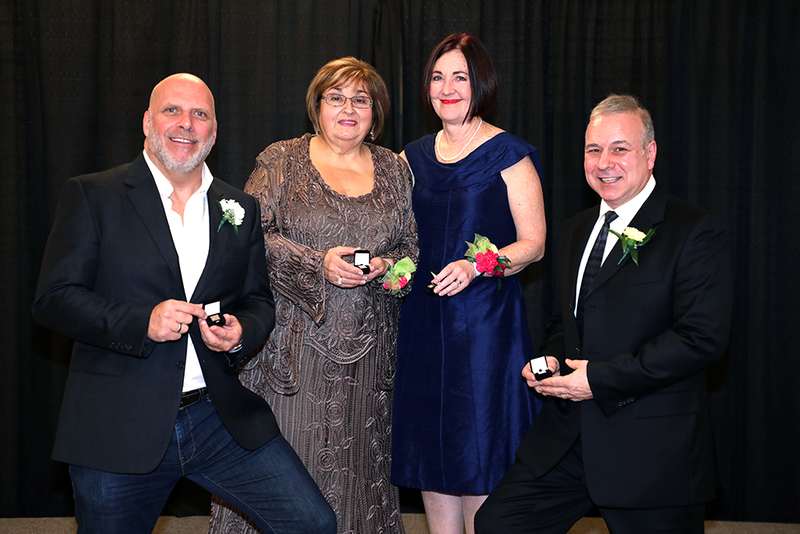 RAHB’s Awards and Appreciation Gala was an evening to celebrate members for their long-standing membership in RAHB, for serving on RAHB committees and task forces in 2017 and for going above and beyond to serve their association and their community. 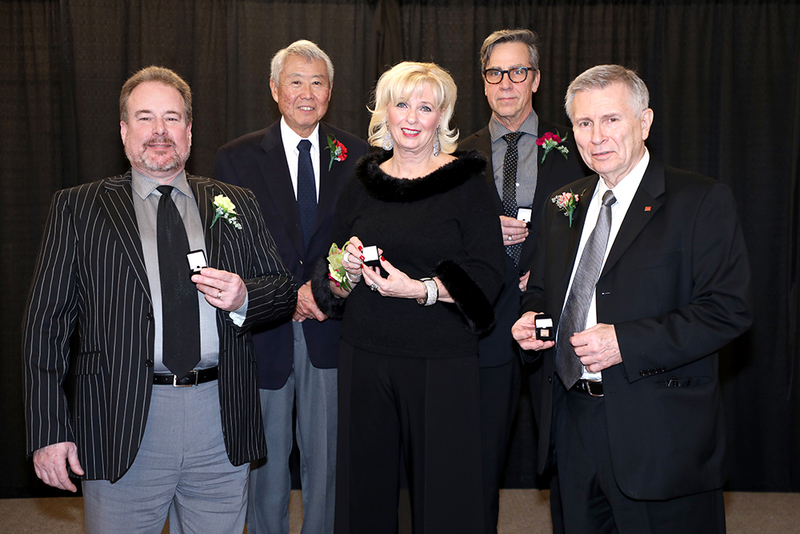 The Gala took place on Saturday, January 20 at Michelangelo Event Venue and Conference Centre. RAHB President Jack Loft recognized Donna Bacher and Andrew Robertson, the two Directors who completed their terms on the RAHB Board of Directors at the end of 2017. He also recognized the 94 members who served on RAHB committees, task forces and the Board of Directors in 2017. 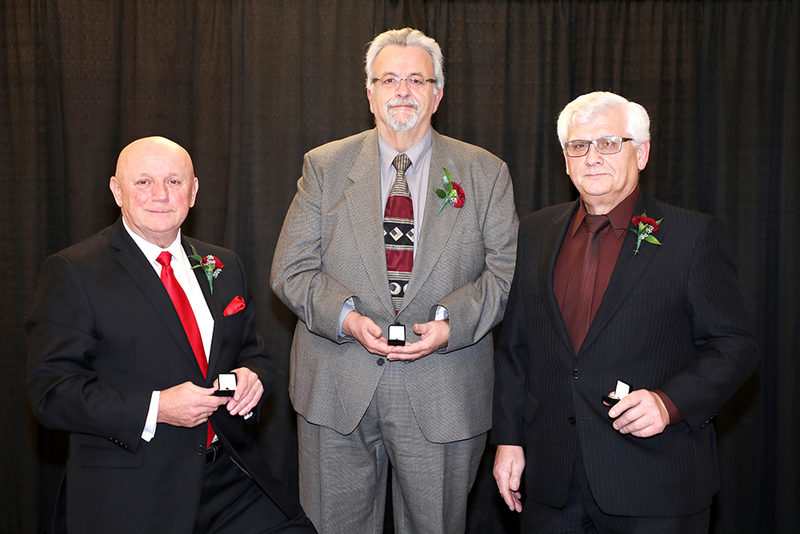 President Jack Loft and Awards Task Force Chair Stacey Adamson presented two RAHB service awards to very deserving members. Donna Bacher (PureRealty Brokerage) received the RAHB Award of Merit for exceptional dedication and service to RAHB and the real estate profession. Donna has been a member of RAHB for 34 years, and has a long history of serving as Chair and member of RAHB committees and task forces, as well as joint task forces with other organizations. She was elected to the RAHB Board of Directors in 2012 and served as President of the Association in 2015. Donna is well known as a highly engaged member of the Association, and she actively encourages other members to become involved as well. Her videos promoting RAHB events and meetings are legendary among members. Often acting as a mentor to new directors and to other members, Donna unselfishly gives of her time for the betterment of the RAHB membership and the Association. 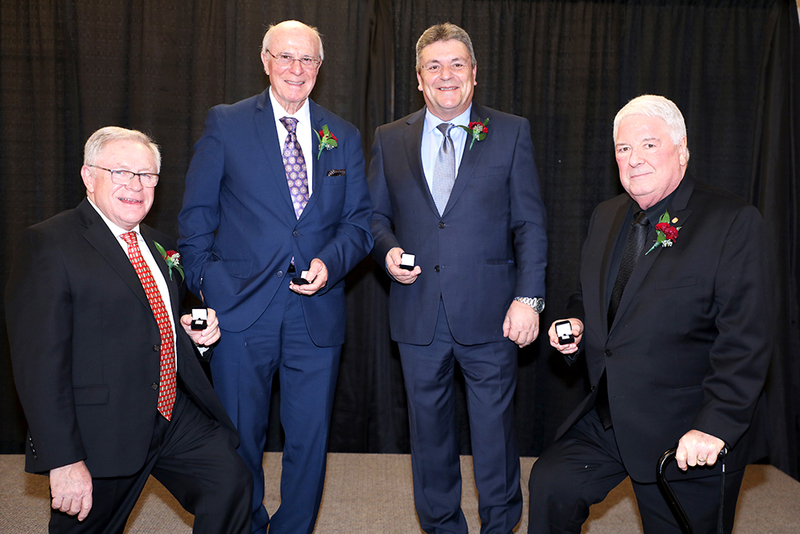 Jim Duschl (RE/MAX Real Estate Centre Inc.) received the RAHB Outstanding Community Service Award, which recognizes a member who has shown outstanding dedication to the real estate profession and exceptional volunteer service to his community. Jim is a 30-year member of RAHB who has served on the RAHB Board of Directors and on the Regional Commercial Network. He is known for always making time to assist and share his knowledge with other REALTORS® and with clients. Jim has been a volunteer driver for the Red Cross for 30 years and continues to help transport the elderly and others to their medical appointments. As well, Jim has been an active member of the Lion’s Club for 28 years; having served as President, he now holds the office of Treasurer. The Lion’s Club actively raises funds for organizations such as Heart & Stroke, Red Cross, Good Shepherd and the Children’s Wish Foundation for the benefit of the community. Jim has also served on the Union Street Cemetery Board. 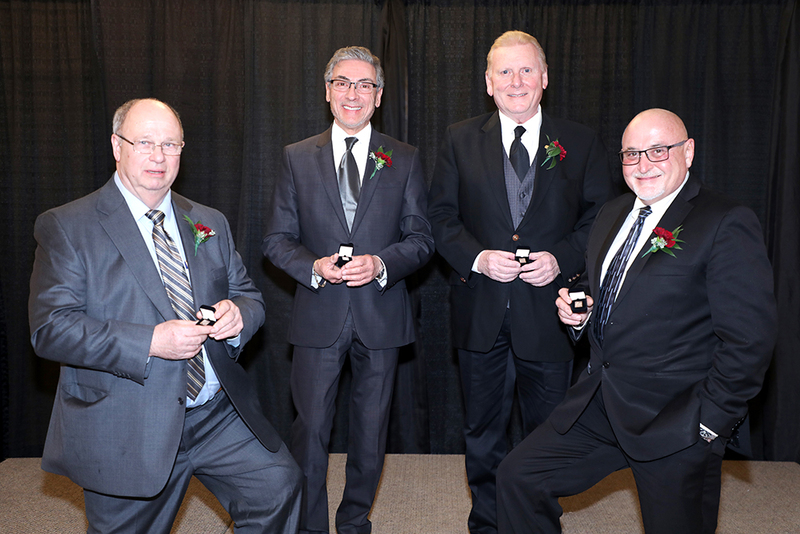 Long service pins were presented to the newest members of the Long Service Club. Twenty-five members reached the 25-year milestone, 14 reached the 40-year milestone, five members logged 50 years of RAHB membership and one member – Tony DeSantis – has been a member for 60 years. Do you know a RAHB member who has been an exceptional volunteer within the Association or around their community? If so, consider nominating them for the upcoming RAHB Service Awards! Award nominations will be open from November 6 – December 6, 2016 and will be presented to winners at the Annual Appreciation Gala in January. If you need assistance or have any questions, email sheilas@rahb.ca. Awarded to a RAHB member who has served on one (or more) RAHB committee(s) in 2016 and has demonstrated exceptional enthusiasm and perseverance or has gone above and beyond to serve their fellow members. Awarded to a RAHB member who is a consistent, long-term volunteer and has demonstrated exceptional dedication and service to the Association by positively contributing to RAHB for a period of no less than three years. Awarded to a RAHB member who has shown outstanding dedication to the real estate industry and exceptional volunteer service to their community for no less than three years. 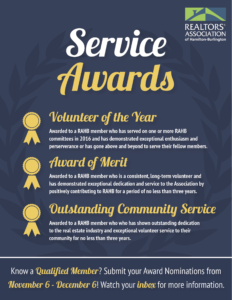 Why nominate someone for a RAHB service award? 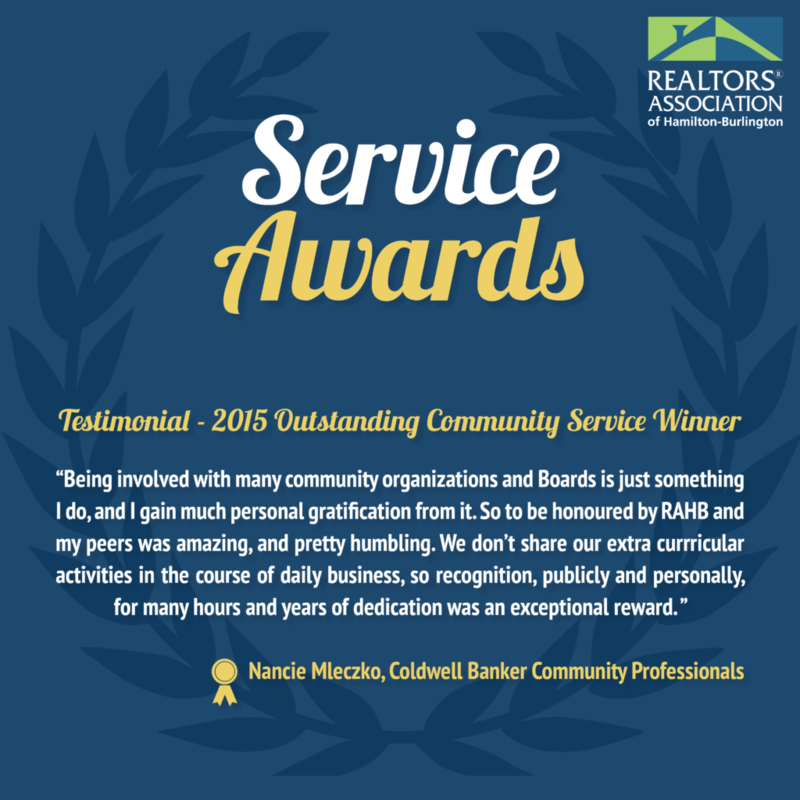 Here’s what 2015 Outstanding Community Service Award Winner Nancie Mleczko has to say! Do you know a RAHB member who demonstrates exceptional qualities, enthusiasm and perseverance or has gone above and beyond to serve their fellow RAHB members? Is that person currently part of a RAHB committee? Then nominate that person as Volunteer of the Year! Do you know a RAHB member who has shown exception-al dedication and service to RAHB and has contributed positively to RAHB for three or more years? Then nominate that person for the Award of Merit! 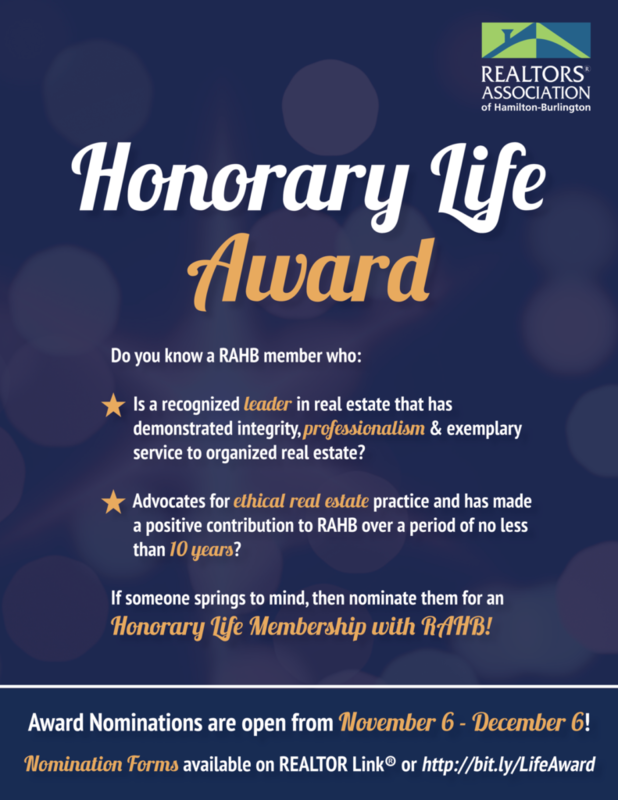 Do you know a RAHB member who has shown out-standing dedication to the real estate profession and exceptional volunteer service to their community for three or more years? Then nominate that person for the Outstanding Community Service Award! RAHB service awards are presented to RAHB members who meet the stringent criteria for the three awards. A panel of RAHB members judges all nominations, so these really are awards presented by your peers. Nomination/Application forms are available on REALTOR Link® under the Member Services tab. Full details about the awards are found on the Application/Nomination forms. The form can be used to nominate a colleague or to apply for the award yourself! It’s easy to fill out the forms. If you don’t have all the information about your nominee’s committee/volunteer history, you can ask your nominee to help you. Or if you want to keep the nomination a secret, you can write “please verify” on the nomination form and your nominee’s history will be checked before the nomination is presented. The Application/Nomination form can be completed online and emailed to Sheila at the RAHB office (sheilas@rahb.ca), or printed, completed and sent to the RAHB office. Deadline for nominations is Friday, November 27, 2015. Do you know a RAHB member who has shown exceptional dedication and service to RAHB and has contributed positively to RAHB for three or more years? 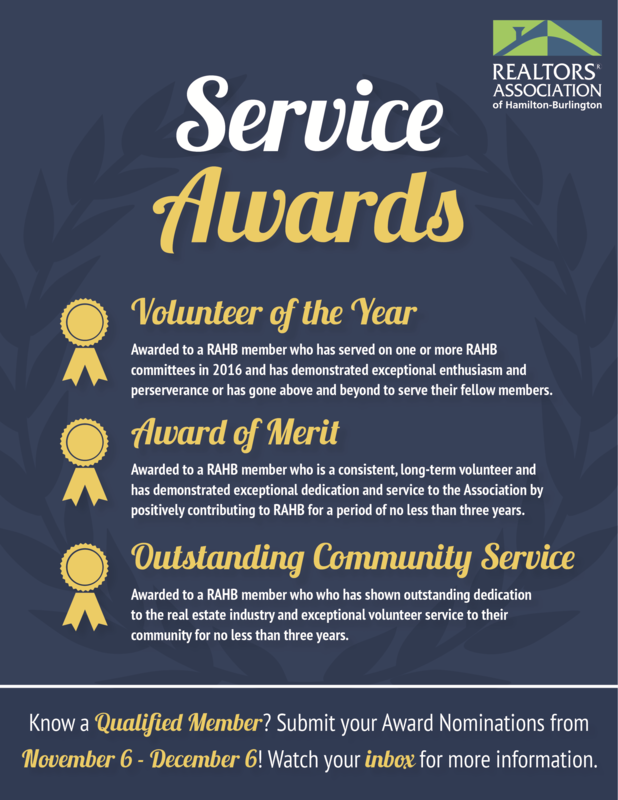 Do you know a RAHB member who has shown outstanding dedication to the real estate industry and exceptional volunteer service to their community for three or more years? (sheilas@rahb.ca, 905.529.8101 x234) at the RAHB office. 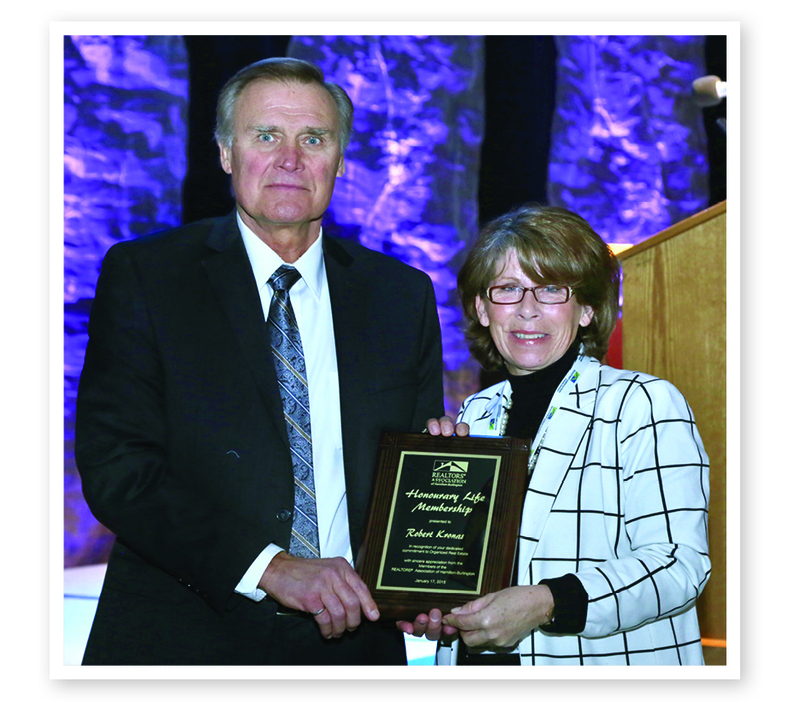 RAHB Past President Robert Kronas (R. Kronas Real Estate) (pictured at left with RAHB President Donna Bacher) was presented with an Honourary Life Award at the March Annual General Meeting. 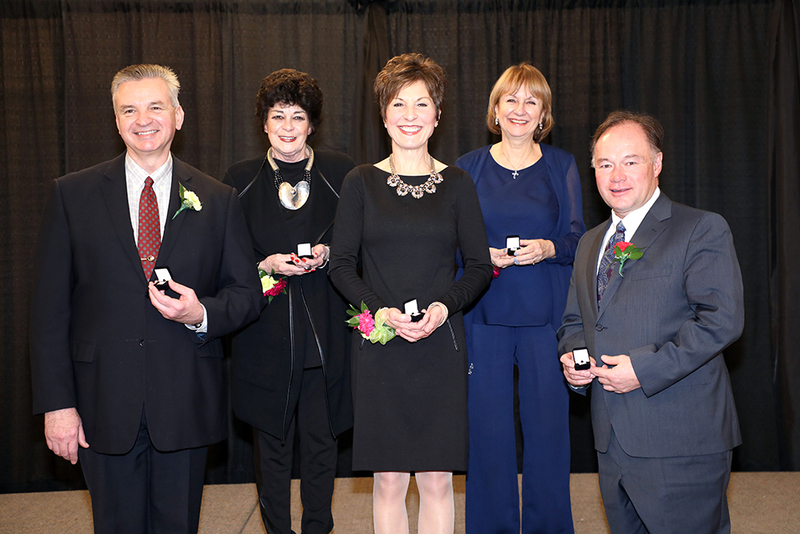 The award is presented to individuals who have rendered outstanding service to the real estate industry and/or the Association. Bob received the award based on his professionalism, integrity, involvement on RAHB committees and task forces and his involvement with affordable housing initiatives in Hamilton. 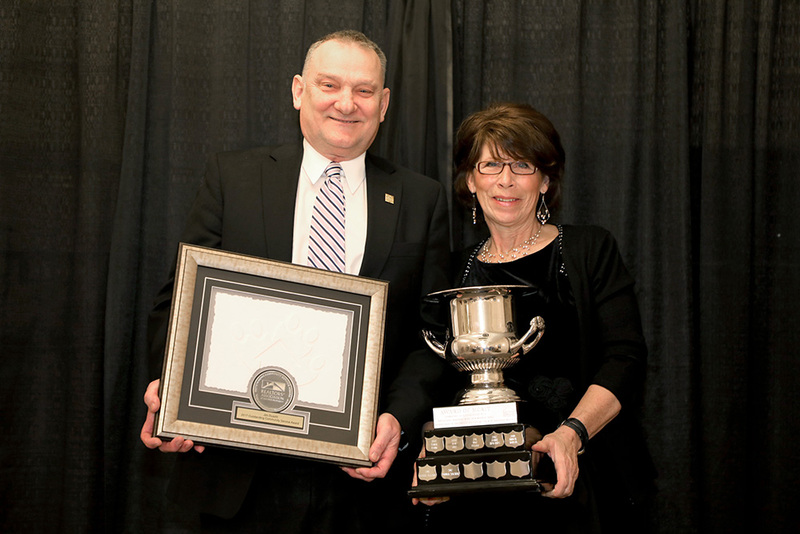 Bob was one of two winners of the award in 2014; the other winner, Bonnie Dowling (B. Dowling Real Estate Ltd.), received her award at the January Awards and Appreciation Gala. Congratulations to the recipients of RAHB awards! Nominations for Honourary Life Membership now open! 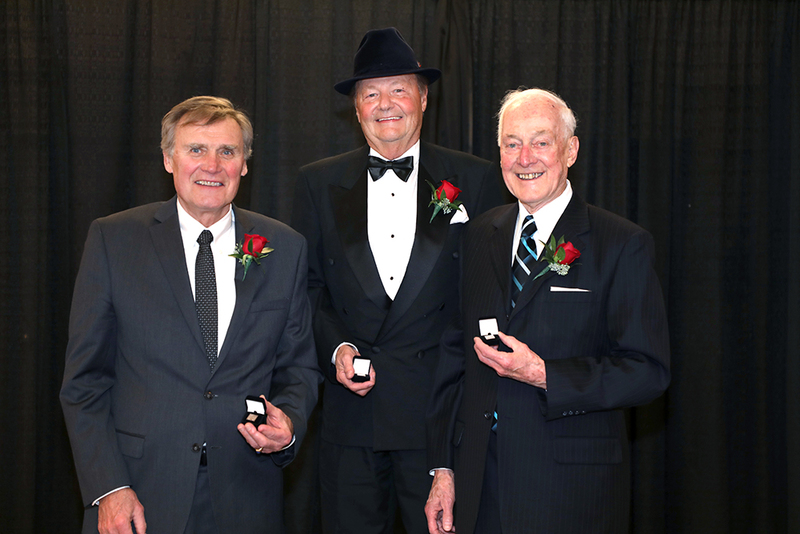 The Honourary Life Award Task Force is accepting nominations for Honourary Life Membership. The candidate must be recognized as a leader in the real estate industry and have made a positive contribution to RAHB over a period of not less than ten years. Full details and nomination forms are located on REALTOR Link® under Membership Information. Deadline for nomination is November 23, 2012.